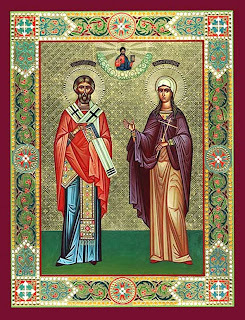 Polemon decided, therefore, to marry Chrysanthos to a pagan girl, hoping to dissuade him and make him return to idolatry, and he forcibly gave him as his wife Daria, a very smart and dynamic woman. However, she verified the famous proverb, that says: "The smart bird is caught by the nose". That is, instead of persuading Chrysanthos to deny Christ, rather he persuaded her to stop worshiping lifeless idols and to worship the living God. He catechized her and then led her to baptism. From then they became one soul in two bodies and worked together as missionaries with enthusiasm and fervent zeal. Their life was indeed venerable, but they "were made worthy of a blessed end". That is, they were made worthy to give their testimony for Christ and seal it with the blood of martyrdom. First, in our daily life things do not always come as we want them or plan, which is why we are disappointed, and sometimes even in despair. However, we should be aware that none of these things happen to us by chance, but they are all in the plan of God's love, Who oversees the world and history and provides for our prosperity and salvation. Besides, luck doesn't exist and none of the events in our lives are the result of coincidences. We are responsible for all things, as long as we are free, and when we leave ourselves in the hand of God to oversee us, then He arranges for us always the best way. This is because God didn't create the world to then abandon it, but to oversee it Himself personally and care for all people, for each individual person separately, without, however, violating anyone's freedom. Therefore, everything is overseen by the uncreated providence and love of God. As long as we are obedient to His will and accept all the events that happen in our lives with a disposition of gratitude and glorification towards God, calmly and with the certainty that whatever God wants or allows is all for our good. When we have patience and especially trust in the providence and love of God, then with the passage of time we understand that all those things we imagined once as an adversity, a setback or a failure proved to actually be a great blessing and a priceless gift from God. Unfortunately, however, our superficiality and impatience do not allow us to savor the benefits of the gift of God. 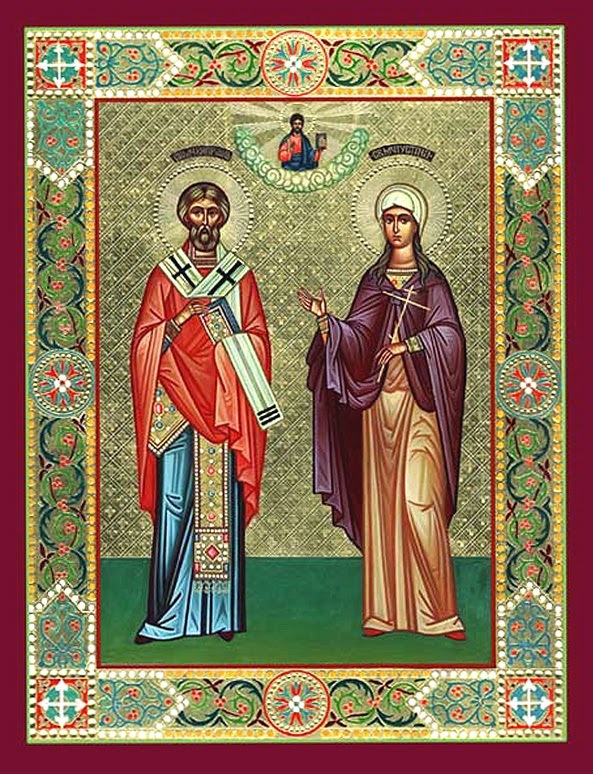 If Saint Chrysanthos didn't have patience with Daria, whom he married in the way described above, then we do not know whether or not she would have been saved and emerged as a martyr and saint. When our way of life is in accordance with the will of God, then we are open to His Grace and so there takes place in our life what God wants. On the other hand, it is possible God does not want certain events to take place in our lives, but He allows them because He respects our freedom, which He gave us. In the first case God is pleased, that is He delights in what takes place, while in the second case He allows. Second, the love between spouses is tested daily and so we must constantly renew it and increase it, to be able to withstand the daily difficulties of life. The way of maintaining and increasing it is constant communication with God through prayer, because God is the giver of perfect love. Love in its authentic form is a fruit of the Holy Spirit, that resides in the heart of a person pure of the passions. Usually we complain that we are not loved by others. But the problem is not if they love us, but if we love them. When one truly loves then they have patience and they take care to undertake any decision calmly after fervent prayer. At this point it should be stressed that anyone can love all people by the Grace of God, but it is impossible to be friends with all, because friendship requires two. That is, you cannot be friends with someone if they don't want to be friends with you, but you can love them and care for them, but you should remain unaffected by their negative behavior and thus ensure your inner peace. When Saint Nektarios was informed, while he was in Egypt, that certain people slandered him with the intention of getting rid of him, he said the following memorable words: " I love them and it is enough for me to maintain tranquility within me." Whoever is internally fulfilled and has a meaningful life, they are indeed blessed, since they have managed to remain unaffected by the negative behavior of others, and therefore they are free to love and truly rejoice in life. Source: Ekklesiastiki Paremvasi, "ΑΓΙΟΙ ΜΑΡΤΥΡΕΣ ΧΡΥΣΑΝΘΟΣ ΚΑΙ ΔΑΡΕΙΑ", March 2009. Translated by John Sanidopoulos.